A bag full of inspiration, don't you think? 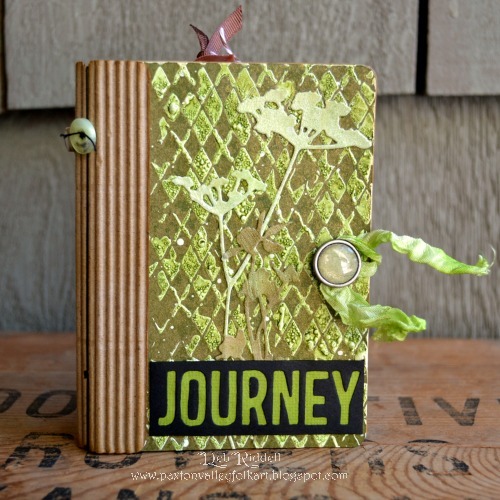 I was inspired by these wonderful ingredients to create a mini travel journal for my niece using Eileen Hull's Passport die. 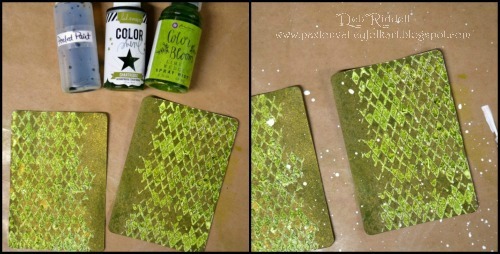 I started out by cutting the journal covers from kraft cardstock and did a stencil monoprint on both of them with Tim Holtz's Argyle stencil using Twisted Citron, Cracked Pistachio and Mowed Lawn Distress inks (all rather 'springy' greens I think!). 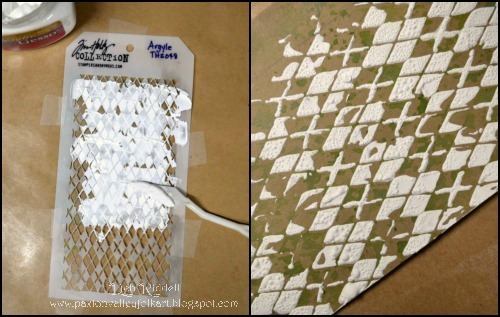 I then turned the stencil, lined it up with the monoprinted pattern and applied some heavy bodied gesso through the stencil. I dried the gesso with a heat gun so it would bubble up for lots of wonderful texture. Spray inks and stains came next; I used Peeled Paint Distress spray stain, Lime Wedge Color Bloom spray mist and Chartreuse Color Shine spray. After the sprays had dried, I splattered on some more white gesso thinned down with a little water. I cut six inner pages for the journal from white copy paper (the Passport die cuts out the covers, the spine and the inner pages) and tea stained all of the pages. I then did some second generation stamping on each page using a variety of stamps from my stash with the same three colours of Distress inks I had used for the stencil monoprinting. To incorporate the crackle technique included in my travel bag, I did three different crackle treatments on cardstock and die cut the flowers using Tim Holtz's Wildflower die. I used Weathered Wood crackle with acrylic paint on the left, Distress Rock Candy crackle paint and Distress ink for the center flowers and Distress Crazing Collage medium and Distress crayons for the flowers on the right. And then it was time to assemble the passport journal. I die cut the spine from kraft coloured corrugated cardstock and made three signatures from my tea stained inner pages and some envelopes that I made. Black heavy button thread was used to sew the signatures in place and I added some buttons to the spine for a bit of decoration. A map brad from Tim Holtz's Custom Fasteners and some Distress ink stained Crinkle ribbon was used as a closure for the passport journal and I glued some of the crackled die cut flowers to the front and back covers. 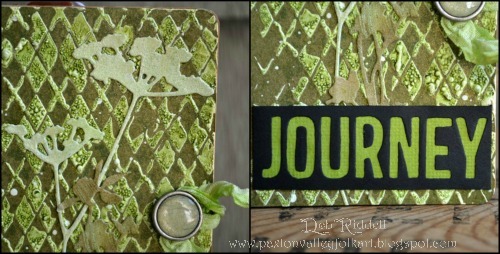 The word journey was die cut using Tim Holtz's Adventure Words:Block die and I backed the negative of the die cut with some green coloured textured card. The inside of the covers were covered with some scrapbook paper from Tim Holtz's Wallflower paper stash and I die cut an envelope from kraft cardstock for the inside of the front cover (using Tim Holtz's Pocket Envelope die). A butterfly was punched from the Weathered Wood crackled cardstock using an EK Success Butterfly Layering punch. Page tabs were die cut from kraft cardstock using Tim Holtz's Tiny Tabs and Tags die and I added some Tim Holtz Remnant Rubs (Words and Elements) and Label Letters to them. A couple of circular paper clips were coloured with alcohol ink and I tied on some bits of twine and ribbon. The picture below shows one of the envelopes that I made to add to the center of each signature, this envelope was made using a digital file courtesy of Vectoria Designs. Tuck spots were randomly added to some pages with scrapbook paper scraps and I made hang tags for them that I stained with Distress ink and hand stamped. The pocket on the back cover was made with a Sizzix Jillibean Pocket w/ Scallop Edge die from kraft cardstock and to it I added one of the crackled die cut flowers, the word 'discover' die cut with Tim Holtz's Journey Handwritten Words die and a mop up tag made while doing the stencil monoprint on the covers. 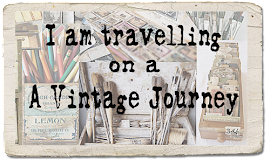 Thank you so much for joining me at our first stop on this month's Destination Inspiration journey, I hope you will come back each Monday this month to see what my fellow Creative Guides will create with the contents of their travel bags. 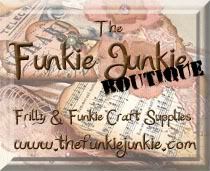 I also hope that you will join us for our April challenge here at A Vintage Journey, Spring Is In The Air. Click here to see all of the amazing projects that the Creative Guides made to inspire you and hope that you will link up your own Spring project! Have a wonderful week everyone and happy creating! WOW! What a project! So much detail! Your niece will be thrilled. 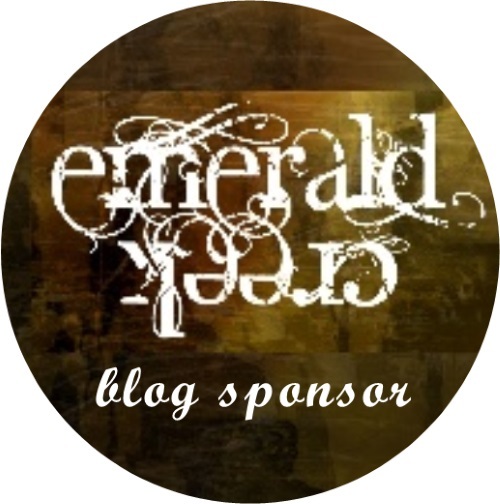 This is such a cool project, Deb! kinda goes without saying really Deba that you picked up the travel bag of ingredients form station no 1 and totally ran with it ! Fabulous project offering so much inspiration . 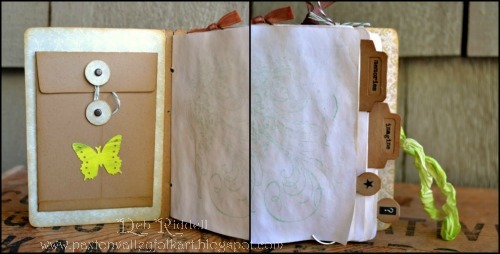 Totally love the passport journal cover and spine and the use of not one but three crackle mediums !! It gonna be tough to follow this one for sure . Apologies Debs for al the typos- Grr those keyboard gremlins lol . What a gorgeous journal!! Love the green and the texture. 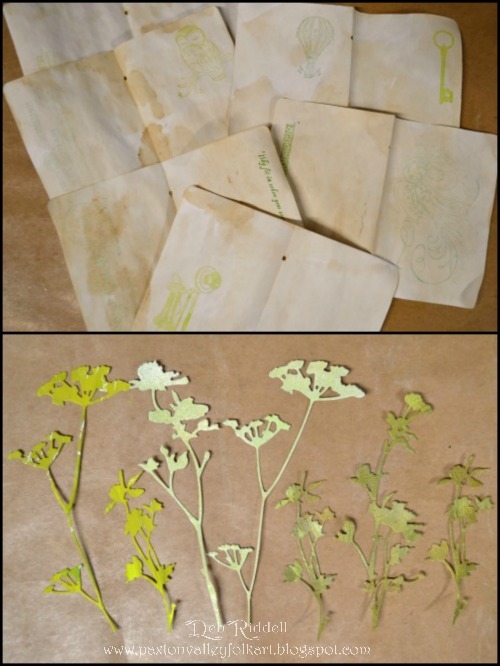 Gorgeous work with the travel bag contents - and a lovely addition to the springtime inspiration too. Fabulous! Lovely journal for your niece! I love that textured pattern on the covers and those crackled wildflowers! Great use of the contents of your travel bag! Thank you for the inspiration! absolutely stunning and inspiring post Debs x Love the colours and fabulous textures that you have created and the inside looks awesome too. Wow Deb! So many things about this I LOVE! 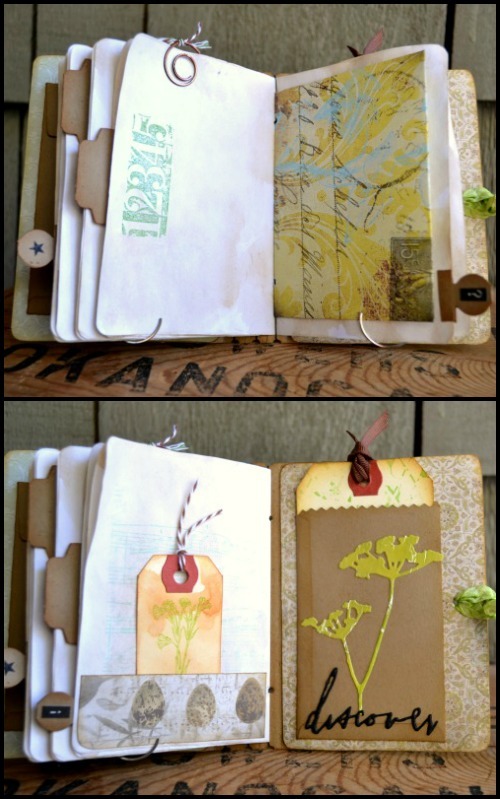 All of the textures, flowers, greens and especially the corrugated binding- "borrowing" that for sure! And what good timing this was too as we featured on Facebook Live today :-) Thanks for sharing this beautiful book! 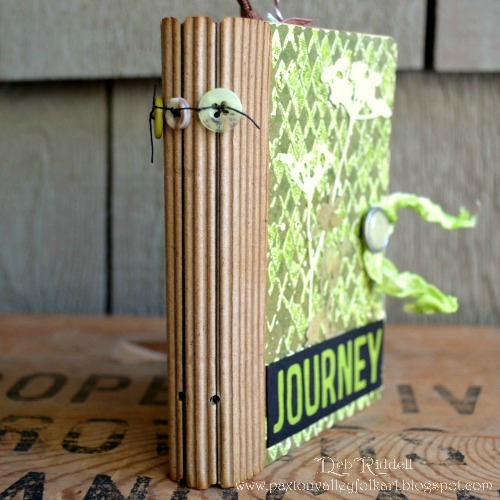 I love this binding! This inspires me!